A single stem bears several flowers on fat, slightly bulging, stalks up the stem, with a small gathering atop the plant. The flowers look remarkably like bees, and are set in the middle of three radiating lilac-coloured sepals which can easily be mistaken for petals. The actual petals are two in number, green shorter and narrow. Short, narrow oval leaves sprout just below each flowering stem. The 'bee' has warm brown and 'fluorescent-like' green markings on its three lobes, the side lobes bearing longer hairs. A mainly green 'hood' towers over the 'bee'. The upper petal of this specimen is folded back somewhat. 18th May 2009, St Julien d'Eymet, Dordogne. The hood partly obscures two yellow pollen-loaded anthers on drooping thin yellow stalks; hovering above the bee ready to transfer the pollen onto any visiting (real) bee. 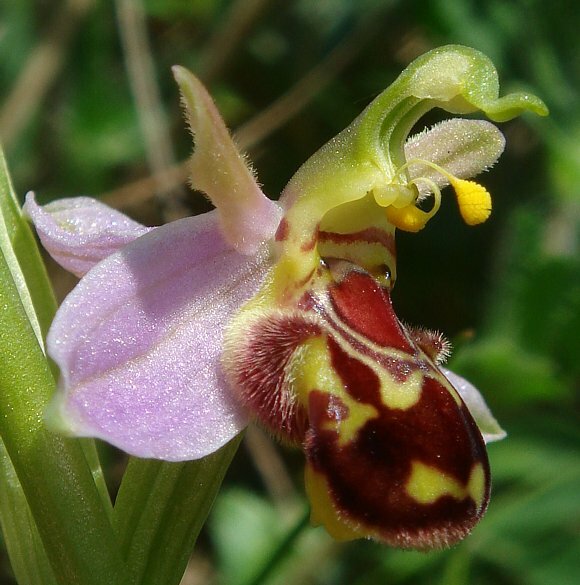 Except that the Bee Orchid is the one and only orchid of the Orchis Genus which is routinely also self-pollinated. The wind catches the dangling anthers transferring pollen to the stigma. Two short, narrow and green 'stump-like' petals emerge either side of the 'hood'. These stubby 'stump-like' petals impart a slug-like appearance to the 'bee'. The two side lobes 'ears' of the bee are more hairy, as is the 'chin' of the 'bee'. 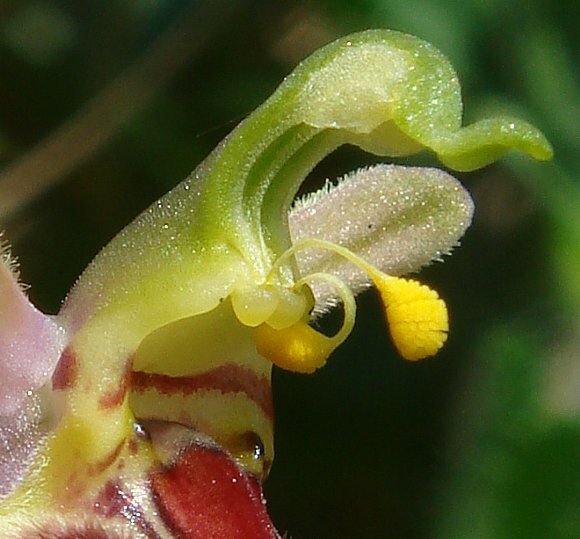 The two stubby petals are also hairy near the extremities. Close-up of above photo. Note the two greyish triangles in this particular specimen. The two anthers dangle above the 'bee' ready to transfer the pollen to any visiting flying insects, bees especially. The two yellow anthers were originally housed in the bulbous end of two slots in the upper part of the 'hood'. The 'throat' between 'hood' and 'bee' appears to offer nectar to visiting bees. The 'bib' around the neck opening in this particular specimen is here seen to be dark purple rather than brown. Variety chlorantha totally lacks any anthocyanin colouring and thus not only are the petals white but the colour of the body reflects the chlorophyll within it, a greeny-yellow. A closer scrutiny reveals there are residual marks on the body where the differing anthocyanins would play if they were present. 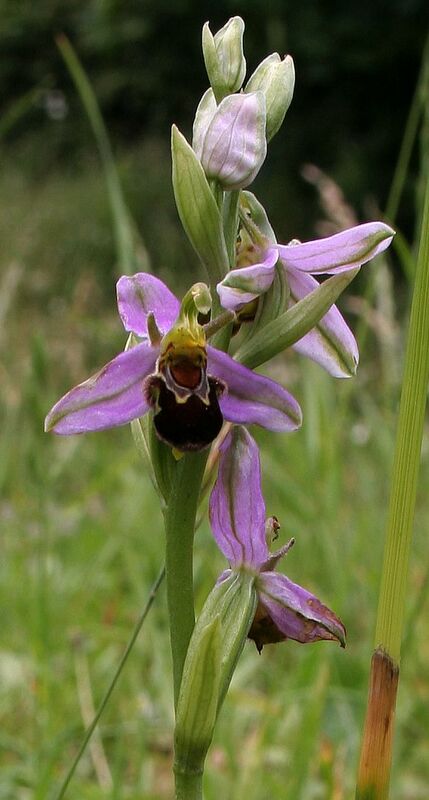 This orchid, a member of the Bee Orchid or Ophrys species, is thought to be a hybrid between Late Spider-Orchid (Ophrys Holoserica) and Woodcock Orchid (Ophrys Scolopax) and seems to have no presence in the UK. 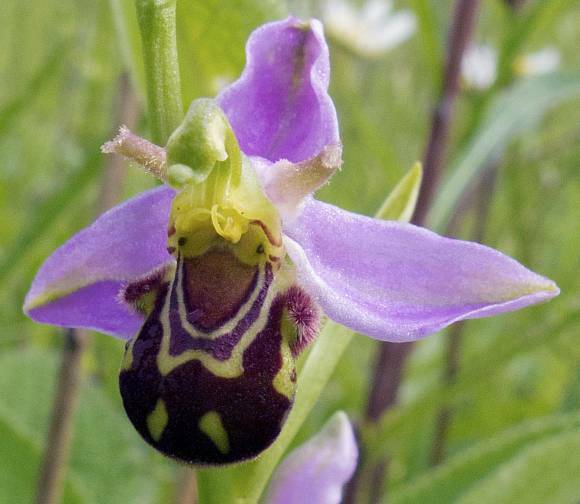 Late Spider-Orchid to produce Ophrys × albertiana (Ophrys apifera × fuciflora) which in the decade of the 2000's was found in only one hectad in the UK (in Somerset) where previously it was found in three hectads. 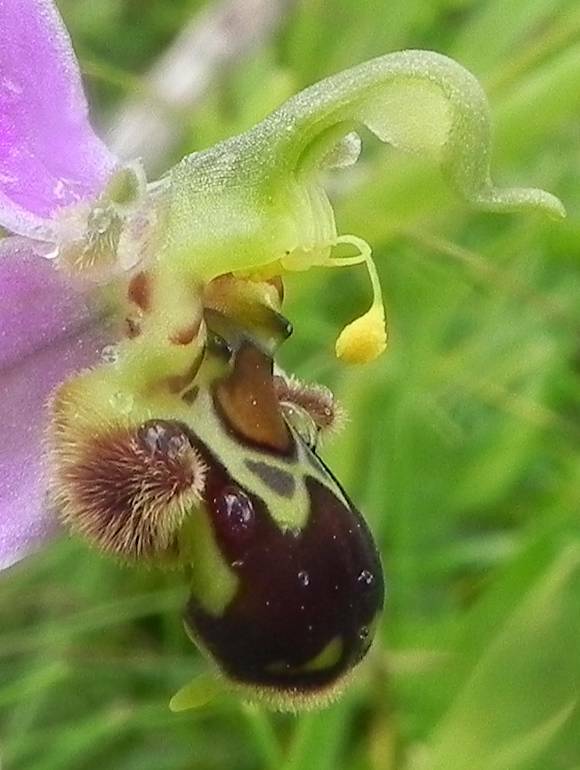 Fly Orchid to produce Ophrys insectifera × apifera. Distinguishing Feature : the three pink sepals fanning out in a triangular shape surrounding a warm-brown flower that looks like a bee. There are also two shorter green sepals sticking out above the bee like fat antennae. 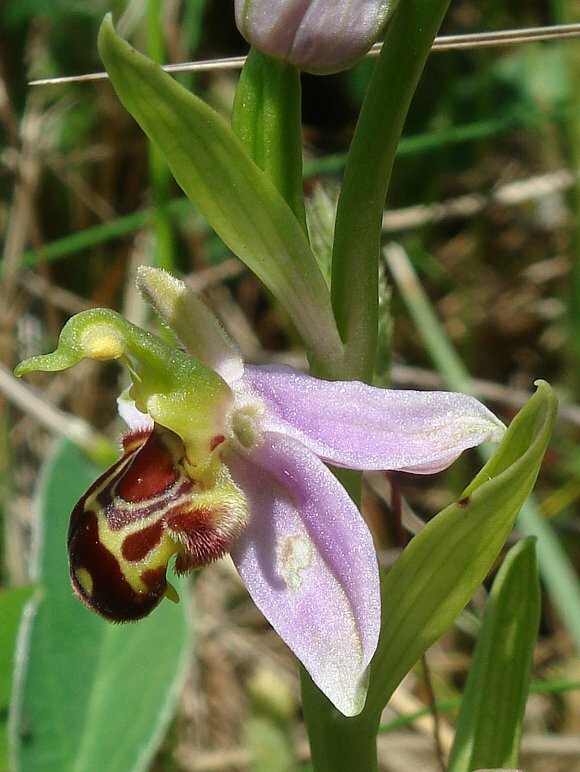 The shape of a Bee Orchid attracts male bees who attempt to mate with the 'bee', who then carry away pollen to pollinate the next bee orchid. 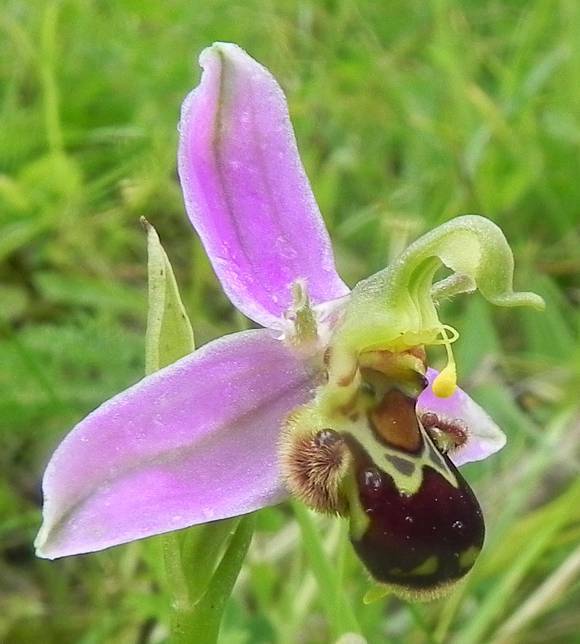 The Bee Orchid cheats; it provides no nectar for the bee. 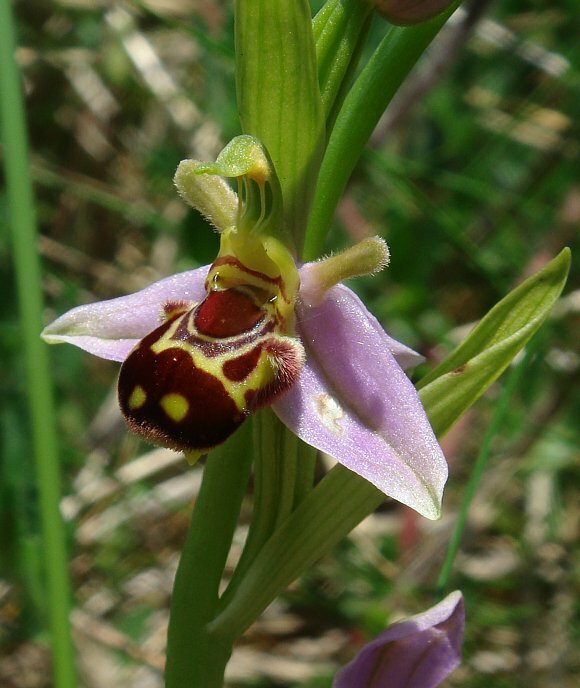 There are eight or more differing varieties of Bee Orchid found in the UK, some not typically shaped (peloric). 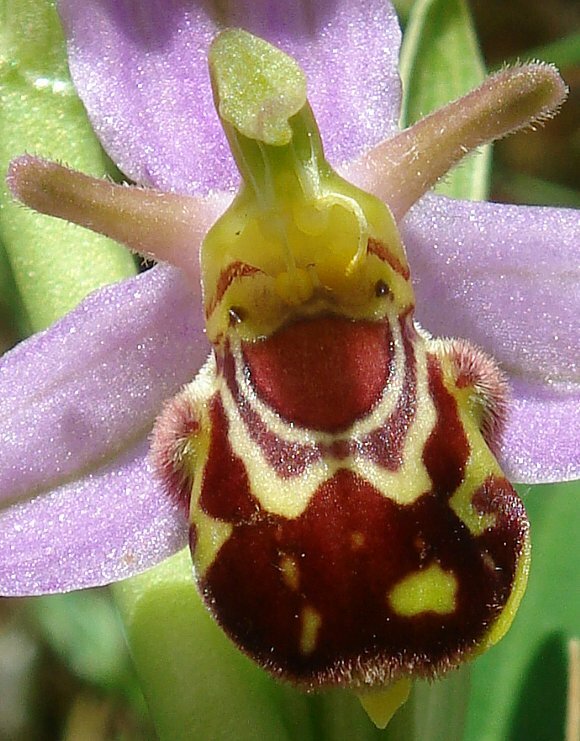 Ophrys apifera var. bicolor Found in Warwickshire, Essex & Dorset. Ophrys apifera var. belgarum Found in Hampshire and now widely known in an area including Essex, Somerset & Northamptonshire. Ophrys apifera var. friburgensisWas in Wiltshire in 1984, now in Somerset. Ophrys apifera var. trollii (Wasp Orchid) Found in Somerset, Dorset, Surrey, Suffolk, Warwickshire & Notts. Ophrys apifera var. atrofuscus Discovered in Sussex in 2001. Ophrys apifera var. chlorantha Sussex, Middx, Essex & Yorks. Two peloric forms are known: both without the 'bee' at all. One with the hood and polinia prominently displayed whilst the other has six pink nearly equi-sized petals/sepals arranged radially, but with slight zygomorphic asymmetry - a condition caused by homeosis. also, peloric flowers with multiple lips are not un-common. A basal rosette of leaves appears early in the year (February) which then wither in spring before the flowering stalk grows in late May or June. They are able to colonise suitable areas and flower in as little as three years where most other orchids might take 10 or so years. Orchids build up their energy reserves in underground two tubers over several years before they have sufficient energy to flower, with alternately one seasons worth of sunshine on the leaves energising one tuber, and the next years sunshine energising the other until the tubers are large enough to allow flowering. After flowering, they have used up most of the energy reserves in the tubers and might need to skip a year or several before re-storing enough energy reserves in the tubers to be able to flower again. 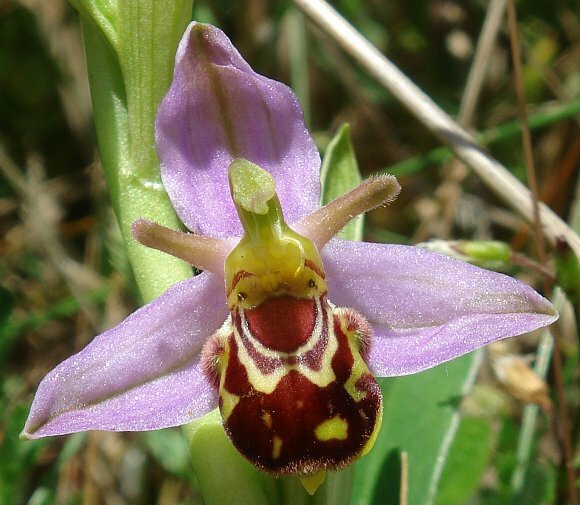 Bee Orchids have a tendency to self-pollinate and a large colony may grow in a small grassy area, usually on undernourished soils, all genetically similar (if not identical) to each other.